Taking a charter out for Gulf Stream fishing Miami is really easy. The Gulf Stream is typically less than 3 miles from our slip in the Haulover Park Marina. Miami & Miami Beach are one of the few places in the world that you can charter a boat for a half day and successfully fish in the Gulf Stream. Catch a Sailfish and be back at the dock before lunch! A Successful Gulf Stream Fishing Miami charter starts with choosing the right charter company. A well maintained charter fishing boat with high quality gear is essential to having a great & successful day out on the Gulf Stream Fishing Miam. Live wells & the ability to catch and store enough quality live bait will differentiate the boats that have consistent awesome catches from the rest of the pack. The Spellbound has three different live wells with over 500 gallons of recirculating sea water to maintain high quality live bait. Once the Spellbound passes into the blue Gulf Steam waters we will be fishing for Sailfish, Sharks, Tuna, Wahoo, Dolphin (Mahi), Kingfish, Snapper, Grouper, Jacks, Tilefish & More… The short distance to the Gulf Stream Fishing Miami alows us to have great catches in just a 1/2 day fishing charter. The methods of fishing we implement in the Gulf Stream are; Trolling, Live Bait Fishing, Kite Fishing, Bottom Fishing, Wreck Fishing, Deep Drop Fishing & More… each type fishing method available every day, depending on the season, what fish are around & the condition’s of each day (wind & Current). Next time you are planing your trip to Miami or Miami Beach or you are already in town, make a little time for a great experience. Deep Sea Fishing on our charter boat off Miami with us on the Spellbound. Capt. Jay & Capt. 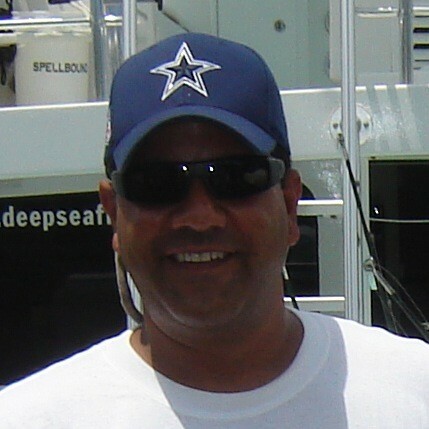 Manny will make sure you and your group, large or small will have a GREAT experience Deep Sea Fishing with us ! If you are ready to book your adventure we make it as easy as possible. Just click here and go to our reservation calendar. Pick your date, size of the group & the type of fishing Miami trip and follow the simple prompts. You will easily book your fishing adventure.